Pick Your Race and Register Today! Online registration closes on Thursday, November 15 at 9:00 AM. You can register in-person at packet pick-up or race morning at the starting areas. Parking is available at both start locations. But please plan ahead as road closures WILL affect your access to parking lots. Note that each race has a different start time and location. There is NO PARKING AT THE FINISH or it the surrounding neighborhoods. Spectators, please park in the designated areas shown on the map below. *Higley District Office, just north of Higley High and the race start, on the east side of Recker Rd. (toilets will be here, also). *LDS church across the Higley High tennis courts on the west side of Recker Rd. *Legacy Traditional School, north of Higley District District Office and on the east side of Recker Rd. Parking is at Nichols Park in the dirt parking lot off of Higley Rd., just south of Guadalupe Rd. We recommend approaching the parking lot from the north due to road closures. 10:00 AM and leave as each bus fills. The last shuttle will leave after the final runner crosses the finish line. The Gilbert Half Marathon and 10k run through the heart of Gilbert, Arizona. The course is flat and fast, making it a great first time experience or a PR possibility. For half marathoners, the course begins at Higley High School. Then runners race along the corn fields along Gilbert’s most popular canals and through premiere parks– including the Riparian Preserve and Freestone Park. The 10k race is the second half of the half marathon. The 10k starts at Nichols Park and joins the half marathon on the canal trails right before the Riparian Preserve. Both races finish alongside the Gilbert Days Parade! The Gilbert Half Marathon events are walker-friendly. We do ask walkers to line up at the end of the starting line’s staging area. The official race end time is 11:00 AM so that roads can re-open. Runners can then move to the sidewalk to finish their race. 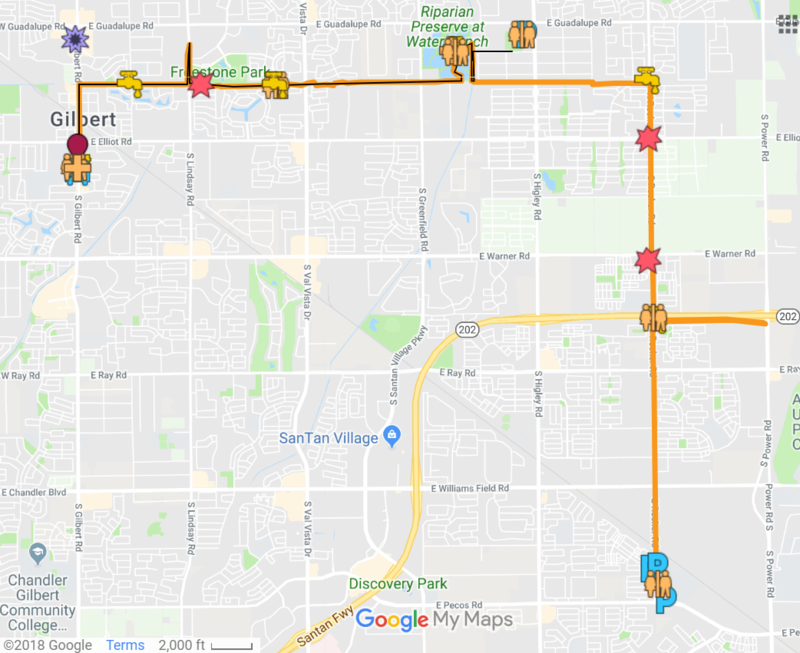 There will be no course support for anyone who continues past 11:00 AM and the Gilbert Half Marathon is not liable for anyone who continues to run after the course is closed. Opportunity to run along side the Gilbert Days Parade! The Gilbert Half Marathon events reserve the right to reject any entry and to disqualify any individual from the race based on non payment of race fees, competing with unofficial number, competing with an official number assigned to another person, transferring an official number to another person, crossing the finish line without having completed the entire course, and/or providing false information on entry forms. The Gilbert Half Marathon reserves the right to change the details of the race as needed. Once you click submit, you commit! We do not offer refunds, deferments or registration transfers. If you want to switch to a shorter distance, just inform us at packet pick-up. No refunds are offered for the price difference. If you want to switch to a longer distance, inform us at packet pick-up and pay the difference in price. We love dogs and kids! But fury running companions and strollers are not permitted on the course of any Gilbert Half Marathon event. Overall Male & Female Winners of both the Half Marathon and 10k will be recognized immediately after they cross the Finish Line! There will be an Age Group Winners Recognition Ceremony starting at approximately 9:45 AM at the Austin’s Journey Stage. You must be present to receive your age group award. Awards will not be mailed or delivered after the event. Now part of the Arizona Series!